Authored by the retired Foreign Service Officer and longtime Knife World Staff Correspondent, this handsome leather bound, limited edition book provides a collectors-eye view of the world of knives. Featuring more than 500 knives and other edged weapons, its much more than a retrospective of collecting adventures -- its an indispensible guide to the knives of the world. Foreword by C. Houston Price. If you've been a KNIFE WORLD reader for any length of time, the name Eiler Robert Cook should mean something to you. Mr. Cook penned his first article for these pages twenty years ago this month [October 1984], and his periodic contributions on knives of the world have made him one of our most popular Staff Correspondents ever since. Mr. Cook's interest in knives first appeared in boyhood, and this fascination grew as a young Marine serving his country during WWII. After the War, Cook began a career as a diplomatic courier with the U.S. Foreign Service that would eventually take him to seemingly all corners of the globe. This, to him, was a dream come true, for everywhere he went provided not only new cultural experiences, but more opportunities to add antique edged weapons to his growing collection! Travels for Daggers is at once a retrospective of Mr. Cook's collecting experiences, a celebration of the many varied pieces he's acquired over the years, and an excellent source of information on the immense variety of knives to be found on this planet we call home. 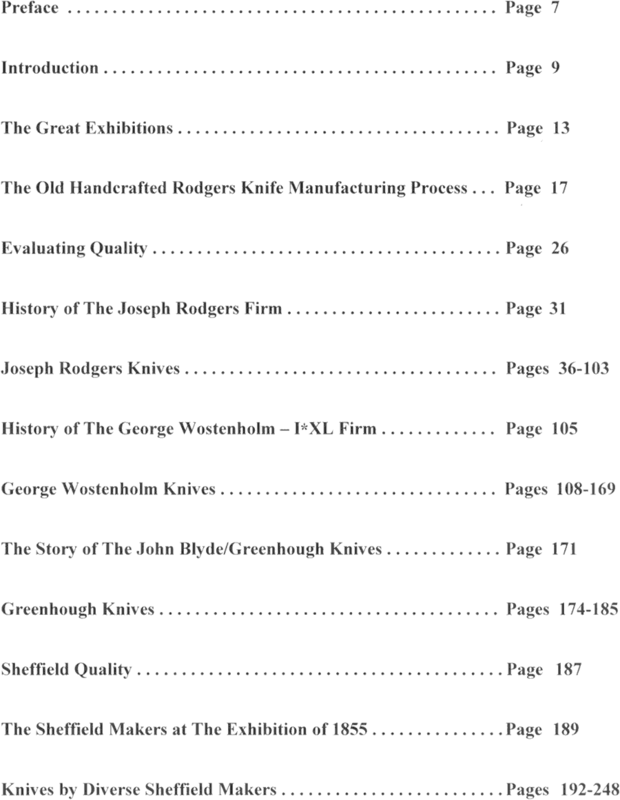 The book consists of fourteen chapters that neatly divide the text into such subjects as the knives of the world's various regions, military knives, and the reproduction edged weaponry that Mr. Cook imported for many years. Interlaced with the blades throughout the book, the reader will find the story of a man whose life experiences could quite obviously fill several books without once losing the reader's interest. Those who think of knife books in terms of dry historical studies and simple price listings will find Mr. Cook's contribution to the knife literature a most refreshing and enjoyable one. Produced only in a collector's edition of 700 copies, Travels for Daggers is a well done book offered at a very affordable price. Whether you're attracted to the world of knives so often overlooked in this country, or you simply enjoy an fascinating story well told, Travels for Daggers is a book that will definitely bring many hours of reading pleasure. 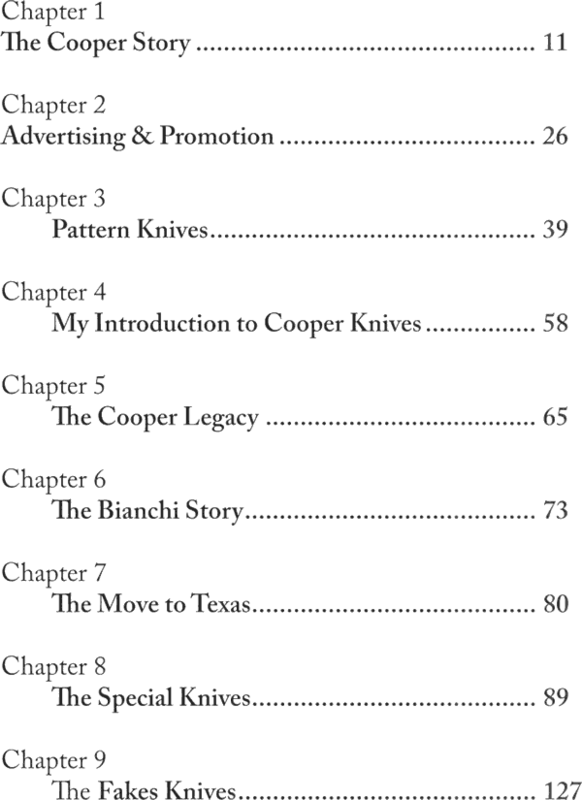 A followup to the very hard-to-find "Book 1," this excellent volume by a dedicated Cooper knife collector contains lots of new information and photographs of Cooper knives. Also useful for those interested in Cooper's associates Jody Samson and Alex Collins. Hardcover, color and black & white photos. This first-class hardcover book is filled with gorgeous full color photographs of some of the very finest knives ever produced in Sheffield, England -- the cutlery center of the world in the nineteenth century. Included are dozens of one of a kind knives from daggers and bowies to fixed and folding dirks, and a wide selection of the world's best multiblade knives such as sportsman's knives. Some of the knives have been positively identified as having been exhibited in the 1851 Exhibition at the Crystal Palace or in the Great Exposition in London in 1879. These "exhibition knives" were never intended to be sold, but were made to be "exhibited" and then retired to the factory as part of the factory collection for posterity. There is very little in the world that has ever been made in which the immediate purpose was for posterity, for culture, for quality, for beauty, for display, for exhibition-and not for sale. These knives speak for themselves; they shout with a loud voice of their birthright. They are the best of the best. Printed on heavy, high quality coated stock and bound in beige cloth, with the title in gold on front board and on spine, this book is a rare treat. It is not only a reference book for collectors, but has also proven to be a real inspiration to many of today's talented craftsmen.